From the kitchen of One Perfect Bite...This is a side dish that I occasionally make when tomatoes are plentiful and inexpensive. Years ago, baked tomatoes were commonly served in the Southern United States and could be found in restaurants across the country where they were used as a garnish for steaks and chops. The dish is actually French in origin and anyone who has traveled through France in the late summer has probably been served Tomates a la Provencale - whether they wanted them or not. This is a very simple dish. 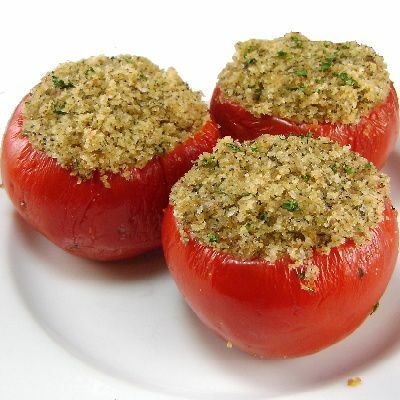 It consists of tomatoes that are topped with seasoned bread crumbs and then baked until the crumbs are crisp and brown while the interior of the tomatoes remain soft and creamy. The dish is not to everyone's liking, but it is remarkably versatile and can be altered to please your family's taste. Here's the recipe I use. 1) Preheat oven to 375 degrees F. Lightly grease a 9-inch round baking dish with 1 teaspoon vegetable oil. Set aside. 2) Cut top third from each tomato. Discard top. Gently squeeze each tomato to extract juice and seeds. Place tomatoes in prepared baking dish, cut side up. 3) Combine bread crumbs, 2 tablespoons olive oil, garlic, Italian seasoning, garlic powder, onion powder, pepper, salt, Parmesan cheese and parsley in a small bowl. 4) Top each tomato with two tablespoons of crumb mixture, gently packing them down with back of a spoon. Drizzle remaining 1 tablespoon olive oil evenly over tomatoes. 5) Bake, uncovered, until topping mixture is golden brown and the tomatoes are tender, about 30 minutes. Remove from oven and let sit for 10 minutes before serving. Yield: 6 servings. I wish that these were still as popular...they look delicious. I have never tried baked tomatoes before, but I imagine I would like them quite a bit. Thanks for sharing, Mary. I can always count on your for inspiring and creative new recipes! Oh Mary, this looks simple, healthy yet so wonderfully delicious! Wow, Mary. You've outdone yourself this time - that photo is amazing! and I'm sure the tomatoes taste wonderful as well. I have never had any, and they look so juicy and good! This is your first recipe that I used your printing thing. It worked great even got the picture! i never knew v could use tomatoes this way,its really so beautiful and nicely done..
Beautiful stuffed tomatoes, look healthy and yummy too! Would love to try one day since I have not tasted these before! questa è una ricetta che mia madre ( era francese ) faceva molto spesso... ed erano squisiti ! Infatti era una perfetta cuoca !!! In ogni caso anche in Italia vengono cucinati molto spesso. A great recipe! Those baked tomatoes must taste so good! Mary, you won't believe it but my French husband just asked to make Baked Stuffed Tomatoes! His - and the traditional French Tomates Farcies are made with a meat filling and I so like your filling better. Much lighter and more flavorful. Thanks for a great recipe and I'll make this for him. I never tire of baked tomatoes. They are yum! I always fall in love with your dishes. Lots of flavors in these tomatos, they were probably perfect to accompany a piece of meat! Maybe not to everyone's liking, but I'm sure it would be to mine. The recipe sounds perfect in it's simplicity. Hope you are having a nice weekeend, Mary. We absolutely adore Tomatoes Provencale and my husband's family has been making this dish so far back that he can't remember when his mother didn't serve it. I can not imagine anyone not loving Tomatoes Provencale. It's a perfect side dish with almost meat or fish dish. Looks like a great way to get a serving of healthy cooked tomato. Wat an interesting baked tomatoes, wonderful! Oh, YUM!!! I have everything except the tomatoes....which I can pick up this afternoon. I love tomatoes so much that, as a teen (and now when I can find the homegrown ones) I would go out to the garden, pick one, wash it off, and eat it like an apple. Thanks and hope your weekend has been a relaxing one! Baked tomatoes were indeed a southern staple growing up; however, they were peeled, cut up and stirred in with big chunks of bread and a little sugar, salt and pepper. They were then dotted with butter and baked. Although I detested it as a child, this dish appears on our table now. Your baked tomatoes look wonderful, Mary! I love the filling you used, it sounds very hearty and flavorful! I love everything about tomatoes and these look especially delicious with that scrumptiously browned crumb topping! These tomatoes look yummy! Thanks for sharing. We enjoy small stuffed and roasted tomatoes with pasta- a wonderful way to use sweet, ripe tomatoes! What a great looking dish, I have so many tomatoes to use up! I love Tomato Provancale...and you're so right you can see them anymore, to bad...it's such a great side dish...especially with steaks. I love baked tomatoes! Yours look fantastic! Such a great idea for a side dish! yum! We have lots of late blooming tomatoes from the bush right now - so I'm trying this out tonight! I use a very similar topping (with capers added) for salmon. I love this - very traditional in southern Italy also. Of course, I am prejudiced - because I make this! I love tomatoes this way. Unfortunately, no one else in my family does. I'll have to make them just for me sometime! :)Have a great week, Mary. this is a great idea, my daughter going to love this side dish. Mary, I love the baked tomatoes! and since we have not had them this year, this is a good reminder to make some for dinner this evening. Thank you.